Small moments and everyday decisions shape a larger heroic saga. Star Wars: Forces of Destiny is a 2D animated web series by Lucasfilm Animation released through Disney's YouTube channel. Set across multiple eras of the Star Wars franchise, it is a collection of two- to three-minute shorts centering on female characters featured in previous Star Wars installments. The series premiered on July 3, 2017, beginning the daily release of a set of eight episodes; these episodes subsequently began broadcasting on Disney Channel on July 9. An additional eight episodes were released in Fall 2017, and the second season of eight episodes are scheduled to be released in 2018. 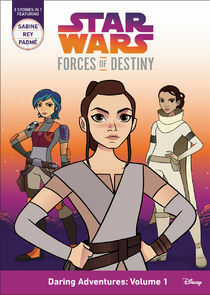 First announced and presented in April 2017 during Star Wars Celebration Orlando, Forces of Destiny is part of a franchise expansion initiative by Disney Consumer Products and Interactive Media and includes a companion toy line by Hasbro and a series of youth-aimed books. The series is the first 2D animated series produced by Lucasfilm since the 2003 Clone Wars series and the first 2D project by Lucasfilm Animation, which formed after the development of Clone Wars. Hondo teams up with bounty hunter droid IG-88 to capture Qi'ra, but she outsmarts both her pursuers by pitting them against each other so that she can collect the bounty on them.